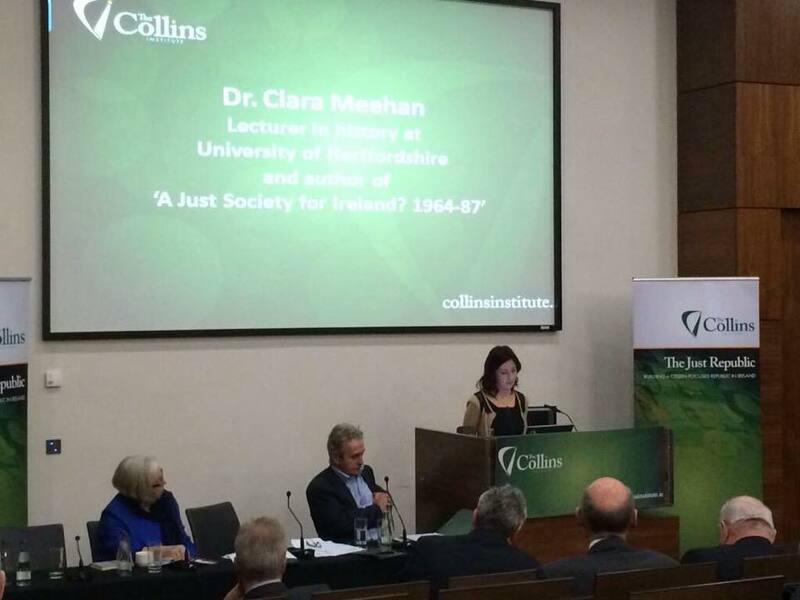 I was back in Dublin earlier this week to speak at the public launch of The Collins Institute, a new think tank set up with financial support from Fine Gael but ultimately independent of the party – a point made clear by An Taoiseach Enda Kenny and Institute Chair Marian Coy. The purpose of the Institute is to make recommendations going forward for the future development of the country. Though supported by Fine Gael, there is no guarantee that the party will adopt any of the proposals produced by the board (which is also open to the possibility of discussions with other political parties). Other than publishing on various moments in the party’s history, I have no direct involvement with Fine Gael. Rather, I was invited to speak at the launch in my capacity as a professional historian. Last year I published A Just Society for Ireland? 1964-87 with Palgrave Macmillan. The book examines the attempts made by a new generation of political thinkers and activists – the first to be born in an independent Ireland – to bring about transformative change in Irish politics and to reshape society. It focuses largely on the actions of Fine Gael, then Ireland’s second largest political party, and, in particular, on two of its major figures: Declan Costello and Garret FitzGerald. It traces the continuities and discontinuities between Costello’s Towards a Just Society, published in 1965, and FitzGerald’s Constitutional Crusade in the 1980s. One of the stated aims of The Collins Institute is to ‘strive to build on the sense of purpose and the concern for justice, opportunity and social reform outlined in Declan Costello’s/Fine Gael’s Just Society policy document’. I was thus asked to talk about who Declan Costello was, to elaborate on what he was trying to achieve with the Just Society in the 1960s, and to consider if there were any lessons that could be learned from Towards a Just Society. Costello’s emphasis was on individuals, on communities and on longer-term support networks. At the heart of Towards a Just Society was a message that still resonates today: social reform and social development must not be paused until economic development has reached a preferred level. Costello was a keen observer of the difficulties in society, and Towards a Just Society put people, their families and the community at the heart of the proposals. It considered the needs of the individual, and how they could be provided for by the state. The role of the state was envisaged to be on that not only made direct provision, but also helped communities to provide support. Though Costello did not completely turn his back on institutionalisation (as seen in his proposals regarding industrial and reformatory schools), he did aim to bring a more humane element to it, and again recognised those within the system as individuals rather than numbers. He was adamant that the state put in place a system of support that extended beyond their time in such institutions. Perhaps one of the most important lessons of his thinking is the idea of treating people as individuals, not collective, anonymous groups. Members of The Collins Institute board and speakers with An Taoiseach at the launch. Photo Credit: The Collins Institute.